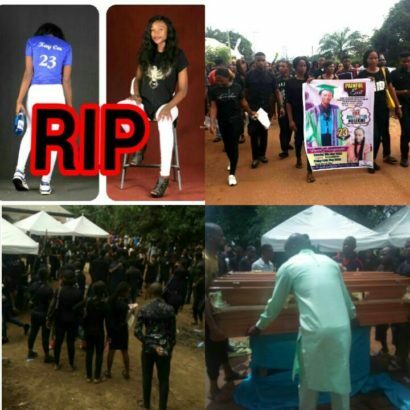 Ibeh kelechi Assumpta, an Imo state University, IMSU final year student who was killed by gunmen on her 23rd birthday has been laid to rest. 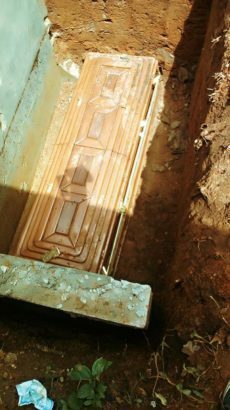 Her burial ceremony which took place on Friday, May 12th at Abakuru in Ohaji/Egbema local government area of Imo state , was attended by family members, friends and schoolmates. The late IMSU final year student was killed on Wednesday, 21st March at Douglas in Owerri, the state capital, while she was celebrating her birthday. Mr. Victor Adiele, the President of Banking and Finance department of the University, which Kelechi was expected to graduate from in August this year, paid tribute to the deceased’s family on behalf of the school. “We send our hearty and warmth condolence over the death of our colleague Ibeh Kelechi Assumpta, her death was a big shock to us and we are aggrieved knowing fully that our colleague is no more”. “We pray that God Almighty will grant the family of IBEH, the fortitude to bear this irreplaceable loss”. Imsu Elijah, THE WIRELESS INFORMANT OF IMO STARS. A 400L undergraduate of banking and finance Imo state university Miss. Ibeh kelechi Assumpta who is expected to graduate by august has been shot dead on her birthday by unknown men yesterday Wednesday 21st March. 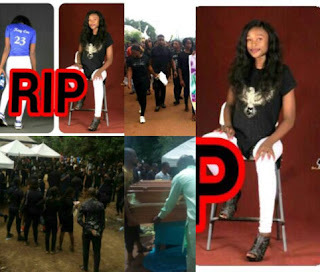 Her family whom she lived with before the untimely death were devastated at the Douglas Owerri scene Wednesday evening where the tragedy occurred over yet to be disclosed issue. According to the brother of the late student who confirmed the tragedy “She was suppose to graduate this year, some one picked a gun, pointed at her, pulled the trigger, she fell in the pool of her blood”. Confirming the sad news also, the departmental president Cmrd Victor Adiele issued an official statement to Imsu Info-media scope led by the wireless informant of Imo stars, where he expressed bitterness and shock over the sudden demise.